A galette is a rustic, folded tart piled high with ingredients, usually mixed fruits and berries. 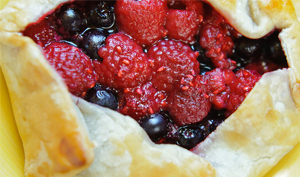 Create a sweet and tart pastry with fresh, ripe blackberries, blueberries, raspberries and strawberries. 1. To make the dough in a food processor, combine the flour, sugar, and salt in the bowl of the food processor fitted with the blade attachment. Pulse to combine, add the pieces of the butter and shortening, and pulse until reduced to ½ pieces. Add the water a little at a time and pulseuntil the dough just begins to come together. Remove the dough to a work surface and shape into a 12 disk. Wrap in the plastic wrap and refrigerate until well chilled, at least 2 hours. 2. Preheat oven to 400 degrees F. Working on a clean, dry, flat surface, dust the surface of the baking sheet and rolling pin with flour, roll out chilled pastry dough into a 13 round about 1/8 thick. Lift and turn the dough as necessary and dust the surface and rolling pin with flour as needed to prevent sticking. Cover with plastic wrap and set aside. 3. In a large bowl toss the berries with sugar, zests, and vanilla extract. Uncover dough and transfer to a well-seasoned Lodge pizza pan. Pile berry mixture in the center of the dough, leaving a 3 border uncovered. Fold the dough up and over the berries, pleating the folds, leavingthe berries exposed in the center. Brush the dough with cream, sprinkle with chopped almonds, and bake for 40 minutes. Remove, let cool for 5 minutes, slice and serve. 4. If making for later use, bake, cool, and cover with plastic wrap, then refrigerate until ready to serve. To serve, preheat the oven to 300 degrees F. Remove the galette from the refrigerator, uncover, and warm in the oven for 15 minutes. It may necessary to cover with aluminum foil to prevent overbrowning of the pastry dough.